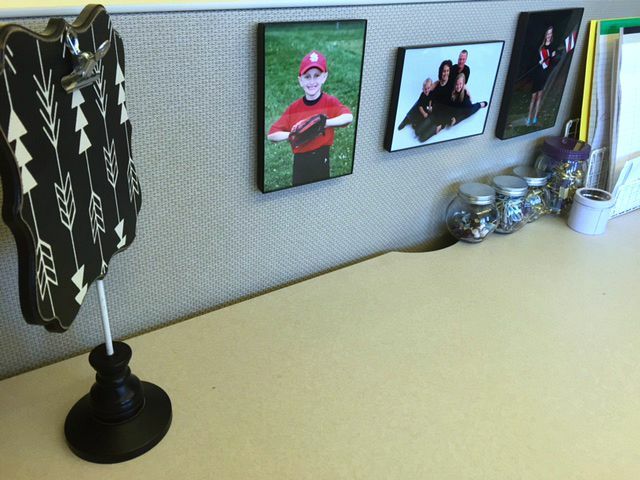 I'm excited to show you a few of the fun things I got to spruce up my cubicle at work. I wanted my desk to be more organized and pretty - I spend a lot of time there - but I didn't want to spend a lot of money. And I didn't want to go too over the top, either, since this is, after all, a professional space. 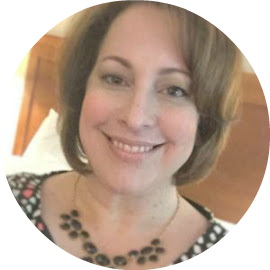 The great news is that there are tons of great looking, affordable options out there and I found some of the best at places like T.J. Maxx, Target and Hobby Lobby. I bought inexpensive front-loading frames at Target. The key is "front loading" because in order to get them to hang on a cubicle wall I had hot glue hook-and-loop tape (aka generic Velcro I bought at a craft store for $1) on the back. The black and white arrow clipboard was set in the corner to hold important papers. 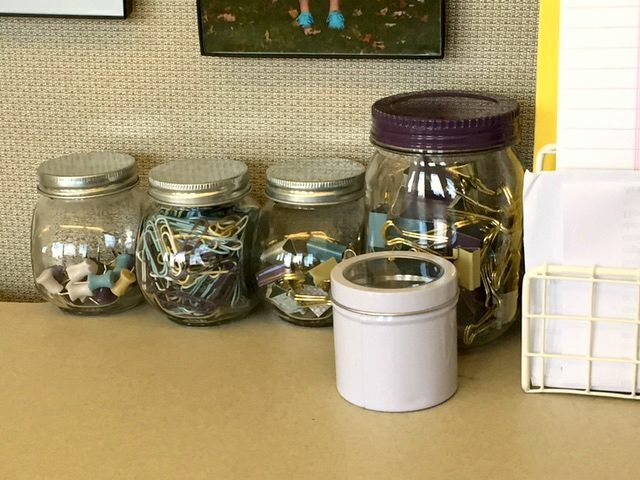 I bought three glass jars at the Target dollar spot for $3 each and filled them with blue, yellow, white and purple push pins, binder clips and paper clips that I found in the office supply aisle of the store. The little white container in front holds glass magnets. I hung a burlap banner on the other side of my cube because, well, why not? The vase in the corner is the office's "just because" vase, which circulates around the office to those celebrating something or just having a bad day. My lovely chevron paperweight was found in the clearance aisle at Hobby Lobby. It was just $1. But hiding underneath the sales sticker were a few others, which I carefully removed to reveal the original retail price: $18. Seriously? Who would spend $18 on that? Not me. But I'd happily spend $1. 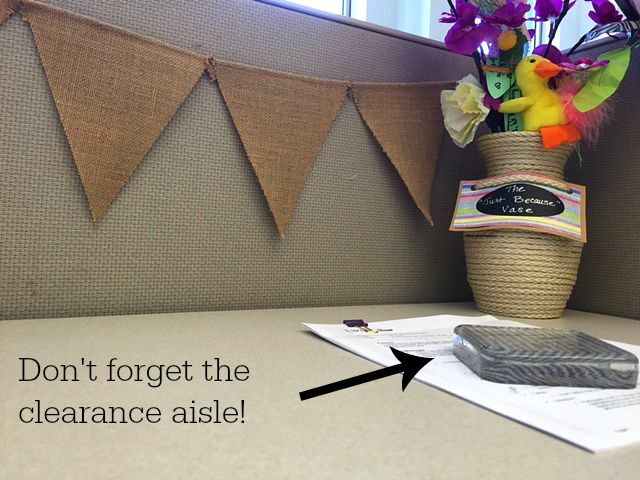 And really, who couldn't use a little extra inspiration at work? 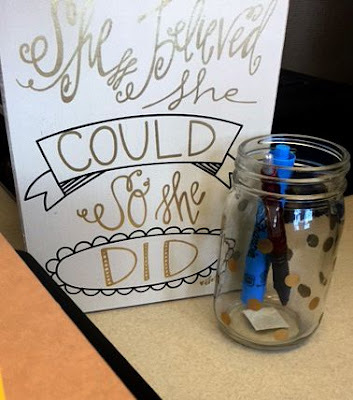 I added this wooden decorative plaque to keep me motivated and sat it next to a gold polka-dotted glass jar that holds pens and markers.